While browsing the Internet this weekend I came across this rather startling post from fleet management company FieldLogix about a new feature in Google Maps in Europe that estimates fuel costs for a trip. What’s startling about this is not the feature itself but the fact that its largely been overlooked despite the potential for broad implications across several industries. I’ll cover more on this (and why we’re so excited by this new development) in a later post, but for now lets just focus on the details of this new feature. It appears that cost estimates are now part of all the European Google Maps sites and can be found at the bottom of the driving directions along with a link to modify car type as well as fuel grade and price. If you modify these options Google will save those changes for future routes. The currency is localized to the country of origin and remains constant regardless of the number of countries traversed in your route. 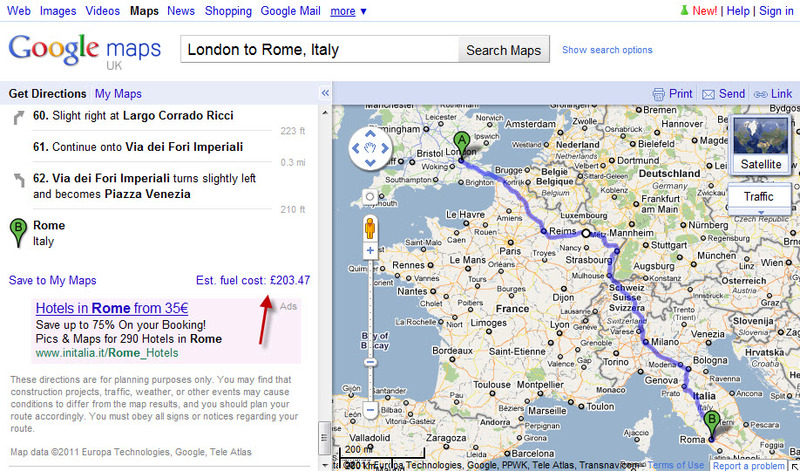 To illustrate I’ve entered a route from London to Rome in Google Maps UK (see below). You’ll note that the fuel cost for this trip is estimated in UK currency even though the trip crosses multiple countries. It’s not clear how the average fuel price of 1.26 British Pounds Sterling per litre is determined but in testing several routes within the UK the same price is applied so I am assuming this is based on a country average. For comparison purposes, Cost2Drive locates the nearest gas price at the origin of the route and then calculates the cost based on real time gas prices along the route to account for regional variations. For example a route from Chicago to New York has an average gas price of $3.12 vs $3.17 for a route from Chicago to Nashville. Additionally, whereas Google’s tool allows for 3 vehicle types Cost2Drive allows you to select the exact vehicle you are driving from a database of over 20,000 cars and trucks so you’ll get far more accurate cost estimates. Cost2Drive also locates the cheapest gas at refueling points along your route, and for routes over 200 miles displays the cheapest airfare found on Kayak.com. Toll costs are not included in the calculation even though they can be substantial in Europe, especially if your route includes a Channel crossing which is around 42 pounds ($68) each way if you opt to take the Chunnel. As an aside, toll cost information is the most requested feature on Cost2Drive and so we’re actively looking at ways to include this information. Note that Michelin’s mapping product does include toll cost information for routes in Europe. In fact Michelin deserves a great deal of credit for being a leader in this space however they are severely hampered by an overly cluttered user interface which has been the downfall of many trip planning applications. It will be very interesting to see where Google takes this feature. Will it soon appear in US maps? Will their driving directions evolve into more of a trip planning product? As I mentioned I’ll share more of my thoughts on this in a later post, but please feel free to share your own thoughts below.